Norwegian will fly to New York from UK for £112 return! Norwegian is already offering some really cheap fares from Europe to the USA but soon we will be able to book even much cheaper flights. 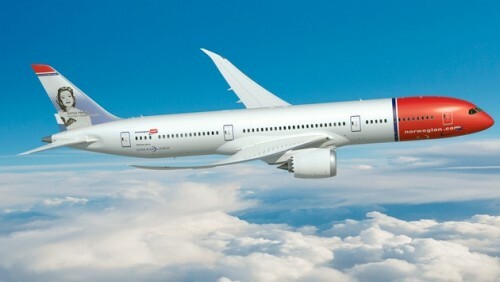 Norwegian Air has announced that the super low £56 ($69) fare will be possible as a result of its new fleet of extra fuel-efficient Boeing aircrafts. This means return ticket from UK to New York will be available for only £112 / €130! The catch? You’ll have to fly from Edinburgh airport, to a ‘secondary’ New York airport – not JFK – and you’ll have to pay extra to bring a suitcase, have a meal and choose your seats. Six new Boeing 737MAX’s are reportedly being acquired in April 2017, with the new Edinburgh to New York service being launched in the following months. Mr Kjos added that avoiding primary airports like London Heathrow and New York’s JFK means ‘we don’t pay as much and can charge cheaper fares’. Norwegian Air currently runs flights from Gatwick to New York with the lowest fare for the next three months set at £179 one-way. Extra charges for checked-baggage vary according to season but generally cost in the region of £40 for an international flight. Earlier this month, Norwegian said it would add 50 per cent more flights between Britain and the US next summer, after it was granted extra flying rights. It is also working on routes from Irish cities like Cork, Dublin and Shannon. Standard tickets from London to New York cost at least £199 one-way or £400 for return ticket. Let’s hope the tickets will be bookable soon and we are sure this record low price will force the competition to offer more competitive rates as well, which is great news for all fans of low cost flights. « 50% off WOW Air sale: New York for €239, Iceland for €84 and more!